Growing up I was very into being a soccer player. Everything I did revolved around developing my skills, becoming faster, stronger, and better than I was the day before. Through that I learned a very very important skill that I never intentionally trained for; the passion and expectation of never settling for less than the best I thought I could be. I had high hopes of going far and becoming the next Mia Hamm like any 12 year old girl playing soccer in the late 90’s. Though that never happened every game and practice was an opportunity to give my best. My teams lost some and maybe I missed a goal but if I knew at the end of the day I did my best, that was the most I could have done and the day was an accomplishment. The games I felt most disgraced by, win or lose, were the ones when I knew I could have beat someone to the ball and didn’t or did not focus on the perfect touch. Those were my greatest disappointments. This same thing applies to being a creative. I constantly am pressuring myself to create “the best” not necessarily the best in the whole creative world but best on my terms. We all know our capabilities and dreams so let those be your gage. My expectations for myself are crazy high and are sometimes a little debilitating to be honest, which is why the print shop took too long to launch. I expect something from myself that may be unattainable, which is frustrating and causes too many bottles of wine to be drank in a week, but I know that because of that ridiculous expectation my work will come out the best it can be each time because I won’t settle for less than I believe I am capable of. The most important part is to remember we are all in the beginning, middle, or end of our journey. This means stop comparing to someone else’s best in their journey to your’s and instead know what is your best for where you are. If you create your best everyday you will never feel the need to feel disgrace or discontent with your work, instead you will rise to your personal challenges and make work that is you and at your place in your journey. This ultimately will produce more original and personal work. Everyday should be another day to be better than we were the last. If we are not constantly expecting the best from ourselves, who else will? Megan–great words…and one of the best things about you is your drive for perfection…don’t let it become the worst thing about you! Sounds like you have a great start on controlling that demon! as a very competitive person, I’m always striving to be my best. it’s took me a while to stop comparing certain aspects of my life to others, but once getting to that point, life is swell and makes the journey 10x more exciting. so excited for your journey with this new shop. You’re “making it happen” alright! It’s very true – and I always feel the same when I play football, match or practice! Agree with Kate, took me a while to stop comparing certain aspects of my life to others too. But like she says once you get to that point, “life is swell”! 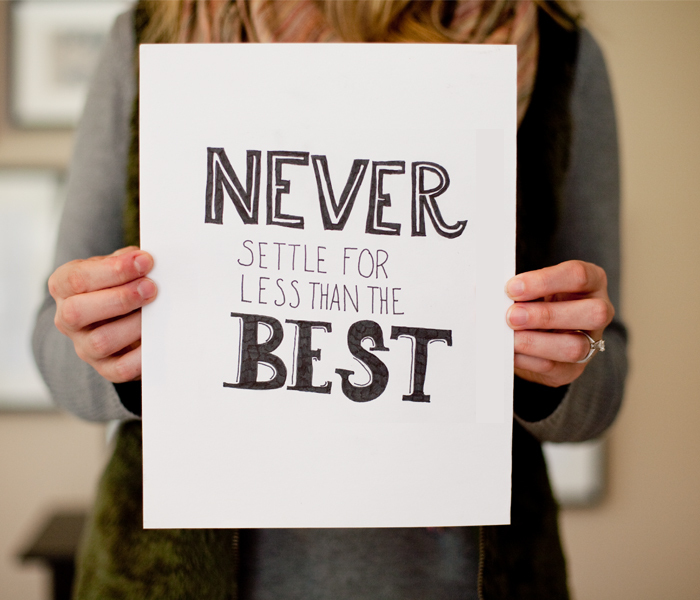 “Never settle for less than the Best”! Such a great reminder (and ditto to the other comments- it’s always important to not compare yourself to other.) Have you seen/heard Ira Glass speak about storytelling? I watch it sometimes when I’m feeling in a rut and that I’ve set my goals too high. Encouraging to know God gifted us all. I totally needed these exact words today. It’s so hard not to compare. And it’s frustrating not being able to achieve everything you want to achieve right here and now. So thank you posting this.